University of Washington Architecture’s Sustainable Design Case Studies graduate seminar visited Ecotope on May 15th. They learned about our firm’s work in the building industry, from building design to equipment research to shaping regional policy around energy efficiency. 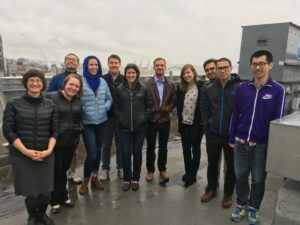 The class toured the office’s efficiency features, including the VRF-DOAS mechanical system installed as part of Ecotope’s participation in Seattle City Light’s Pay for Performance program. Ecotope is a professional stakeholder member of Seattle District 2030, as well as a business located in the downtown 2030 district. We worked with the historic Alaska Trade Building’s owner and met the 2030 challenge for our tenant space with variable refrigerant flow heat pumps and a state of the art energy recovery ventilator we designed with the manufacturer. Students learned about the old and new equipment on the roof, and also checked out the views of the waterfront!